Department for Community Welfare, Logo, 1976, courtesy of Department for Child Protection and Family Support, Department for Community Welfare, Western Australia , Annual Report 1976. The Department for Community Welfare was established in 1972, and was the key government organisation responsible for child welfare in Western Australia. It took over the Child Welfare Department and the responslbilities to Aboriginal children held by the Department of Native Welfare and Commissioner of Native Welfare. The Department for Community Welfare was replaced by the Department of Community Services in 1985. Under the Child Welfare Act Amendment Act (No. 2) 1972 the functions of the Child Welfare Department were transferred to the Department of Community Welfare. In the same year, the Aboriginal Affairs Planning Authority Act of 1972 repealed the Native Welfare Act 1963 and the remaining functions of the Department of Native Welfare, including the responsibilites to Aboriginal children held by the Commissioner of Native Welfare, were transferred to the Department of Community Welfare from 1 July 1972. The functions of the Department for Community Welfare, as defined by the Community Welfare Act 1972 included: promoting individual and family welfare in the community; to conduct, promote and encourage programmes of training or rehabilitation; and, to provide assistance when the welfare of any individual, family or group is threatened or in jeopardy. The Department for Community Welfare was abolished and its name changed to the Department for Community Services on 1 January 1985. The Department for Community Welfare ran Katukutu Employment Hostel from 1974 to at least 1982 and possibly longer. Department for Community Welfare, State of Western Australia managed Koolingar-Mia Group Home, Collie jointly with the Collie Welfare Council. The chief executive officer of the Department for Community Welfare, was the guardian of any children at Wollaston who were deemed to be 'native wards' or 'wards of the State'. Personal files from this series were transferred to the Department for Community Welfare in 1972 when it assumed 'control' of Aboriginal children from the Department of Native Welfare. The person files would be closed for up to 100 years. Files created by the Department for Community Welfare are held in this series at the State Records Office of WA. The records in this archival series were transferred to the Department for Community Welfare in 1972. The Department was represented on the Child Abuse Review Panel. The Aboriginal Affairs Planning Authority Act 1972 abolished the role of Commissioner of Native Welfare and his Department of Native Welfare, and the remaining resopnsbilities to Aboriginal children were taken over by the Department for Community Welfare. The Department for Community Welfare was created by the Community Welfare Act 1972. Applecross Cottage was run by a Church agencies under agreement with the Department for Community Welfare, State of Western Australia. The Chief Executive Officer of the Department for Community Welfare was the guardian of any children at Bamburra Hostel who were deemed to be 'native wards' or 'wards of the State'. The Consultative Committee on Residential Child Care reviewed and evaluated residential child care facilities that were subsidised by the Department for Community Welfare. The Chief Executive Officer of the Department for Community Welfare was the guardian of any children at Fairhaven Hostel who were deemed to be 'native wards' or 'wards of the State'. The Department for Community Welfare placed children at Gilead Boys' Home. The Department for Community Welfare placed teenagers at the Gnowangerup Agricultural College (or School). The Chief Executive Officer of the Department for Community Welfare was the guardian of any children at Kurrawang Cottage, Boulder who were deemed to be 'native wards' or 'wards of the State'. The Chief Executive Officer of the Department for Community Welfare, was the legal guardian of any children at Lombadina who were deemed 'native wards' or 'wards of the state'. The Department for Community Welfare placed Aboriginal teenage boys at Millijiddie Station. The Chief Executive Officer of the Department for Community Welfare, was the legal guardian of all Aboriginal children at Mount Margaret Mission. The Department for Community Welfare placed young children under the age of six years at Ngal-a Mothercraft Home and Training Centre Inc (Ngala) and, until 1980 when Ngala ceased its involvement in adoption, may also have placed young expectant mothers there. The Chief Executive Officer of the Department for Community Welfare was the guardian of children at Norseman Mission who were deemed to be 'native wards' or 'wards of the State'. 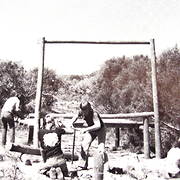 The Chief Executive Officer of the Department for Community Welfare, State of Western Australia was the guardian of any children at Pallottine Mission, Tardun who were deemed to be 'native wards' or 'wards of the State'. 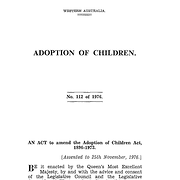 Past Adoption Information and Services can assist people who are looking for information about adoptions arranged by the Department for Community Welfare. The Chief Executive Officer of the Department for Community Welfare was the guardian of any children at Roelands Village who were deemed to be 'native wards' or 'wards of the State'. The Chief Executive Officer of the Department for Community Welfare was the guardian of children at Sister Kate's Children's Cottage Home who were deemed to be 'native wards' or 'wards of the State'. Department for Community Welfare placed male and female Aboriginal teenagers at Strelley Station. The Chief Executive Officer for the Department for Community Welfare, was the guardian of any children at Wandering Mission who were deemed to be 'native wards' or 'wards of the State'. The Chief Executive Officer of the Department for Community Welfare was the guardian of children at Warburton Mission who were deemed to be 'native wards' or 'wards of the State'. The Department for Community Welfare placed male and female Aboriginal teenagers at Yandeyarra Station. ‘Port Kennedy Beach Camp’ shows a scene from one of the regular school holiday camps run by the Department for Community Welfare for children and young people involved with the department. Sources used to compile this entry: 'AU WA A39 - Department for Community Welfare', in State Records Office of Western Australia - Organisations & People, State Records Office of Western Australia, 2015, https://archive.sro.wa.gov.au/index.php/department-for-community-welfare-au-wa-a39.